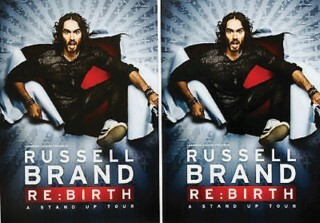 The Windham Eagle Entertainment: Movie review of Netflix comedy special of Russell Brand's "Re:Birth"
Movie review of Netflix comedy special of Russell Brand's "Re:Birth"
“Re:Birth” is a return to stand up for British comedian, musician, actor, artist and activist Russell Brand. He is a man of many labels, and that shows through in his standup comedy, as he constantly tackles challenging prospects. Whether it be what parenthood means, the current state of politics, poverty or the media. Brand is walking on ground that many comedians have walked before, poking fun at the powerful to get laughs out of every man. However, Brand provided something more in this special. There was a genuine passion to his message, that he truly cared for the people he thought were being put down. He lives by ideals and gets a laugh out of the audience by poking fun at those who poke fun at him. However, never once did I feel like Brand came across as arrogant. Self-deprecation is used by many comedians, and Brand lathered his entire show with it. He makes sure that the audience knows that while he may seem like a philosopher on his best day, or a provocateur on his worst, he's also an idiot. Whether it be accidentally taking food from the poor or making a fool of himself on live television, Brand spent a good portion of the special lampooning his own impassioned nature. It wasn't all vitriol and deprecation though. The special had a genuine heart, in which Brand spoke through poetry about his fears in the world and his desire to see it become a better place. The title itself “Re:Birth” is in reference to his daughter, who was just recently born. Brand taps into knew meaning as he comes to understand more about the world through the love he has for his child. That is the true heart to this special. While it can be crass and raunchy one moment, it's genuine and hopeful the next. Brand didn't break new ground with “Re:Birth”, but he certainly has made a stand up set that's polished, funny, and interesting.